Today's S.U.S. edition is a little different. Not only am I featuring doll clothes but introducing a doll. You may have seen her popping in a few previous blog entries but she hasn't been officially introduced [..And she's not cool with that...]. 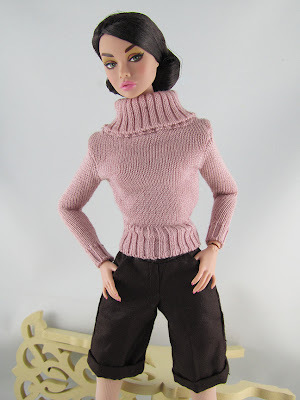 Since she came in a set with three awesome outfits, I thought it best to show her off today rather than on a 'Doll Tale Thursday'. As you can see from the above photos, I decided to relax Nimue's extremely gelled hair. The unnaturally stiff look just wasn't working out for me. 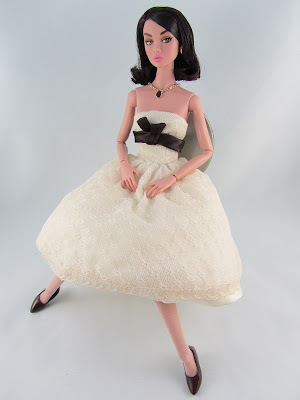 Now that her hair is relaxed, this particular doll and the outfits she came with makes me think she's a doll version of a young Jacqueline Kennedy Onassis in a casual, formal, and business chic attire. My favorite out of the three is the suit. She looks ready to fashionably run for office. The white gloves were a nice touch but extremely hard to put on due to the way her fingers were spread out. I thought I was going to rip them. Luckily, it didn't get to that. That would have made me cry. Those shoes, on the other hand, are just awesome! The two-tone color and the pearl clasp is not something you see on doll shoes very often. Despite a few minor difficulties, I had a blast playing dress-up! She is very pretty and all the outfits are lovely! I am especially in love with the two-tone spectator Mary Janes! I use to have a pair those but that was another size ago!